Missiles, threats and sanctions: How should the United States respond to North Korea? Today the United Nations Security Council will meet and vote on a resolution to impose new restrictions on North Korea. This resolution is a direct response to recent North Korean missile activity and threats from Kim Jong Un. On July 4, North Korea tested an intercontinental ballistic missile and claimed it could hit any nation on Earth and just last month, North Korea launched a Hwasong-12 missile over Japan. CNN reports that the nation has already fired 21 missiles in 2017. Kim Jong Un threatened the United States (which drafted the resolution) that it would pay a “due price” if such sanctions pass. Earlier this year I interviewed Suzanne Scholte for a Religion & Liberty cover story on human rights abuses in totalitarian regimes. After North Korea’s most recent missile launch, I checked in with Scholte to get her reaction. She is the president of the Defense Forum Foundation and an expert on North Korea and its human rights violations You can read the entire exchange below. Acton: When policy analysts and news commentators talk about a possible outbreak of hostilities on the Korean peninsula, they talk about a catastrophic human tragedy. They talk about a mass migration of North Koreans into China. What are they risk, from your point of view, for a people who have already suffered greatly? [Scholte:] There are no good options on the table right now except the one that is being ignored: a dedicated outreach to the people of North Korea. I believe that Kim Jong Un will push and threaten to the extreme but will not do anything that could provoke a military response from either the USA or the Republic of Korea (South Korea). Here’s why: He simply wants to maintain power and he will not do anything that could risk the loss of his dictatorship. His ultimate goal is reunification and taking over the South. Everything he is doing is working towards that goal — testing the ROK-US alliance which is the single greatest obstacle in his way. His strategy is playing out beautifully as pro-Kim Jong Un leftists protest the THAAD deployment and the ROK-USA alliance. And we fall into the trap because we are not remembering the people of North Korea. We should be doing everything we can to broadcast to them that the USA is their friend, not their enemy, and it is that very friendship that we have had with South Korea that helped propel them to being one of the world’s most advanced countries in the world. That is the same vision we have for North Korea and we have to articulate that strongly to the people of North Korea, who are brainwashed from childhood to hate us and believe all sorts of lies about us. Just to illustrate that point, during North Korea Freedom Week in April 2017, the defector delegation kept telling us: the truth will set them free. The real tragedy here is that when we focus on Kim’s threats to bomb Guam and not reiterated strongly our concerns for the people of North Korea we play right into Kim Jong Un’s strategy: that America’s only is the harm Kim can do to us, not the horrific harm he has done to his own people. We help feed into the lie that Kim uses to justify his nuclear ambitions. Would the current North Korean regime, if it survives, become even more reactionary and oppressive? YES, it must to maintain power and what is happening to the refugees trying to escape is just one small example of that. Right now, 80 percent of North Koreans who attempt escape carry poison as they would rather die than face repatriation back to North Korea. Just recently, a family of five committed suicide after their anguished appeals to the Chinese security went ignored and they were transported to the China-North Korea border to be turned over to North Korean authorities. Last month Kim Jong Un declared that he wanted eight defectors assassinated: the top two on the list were Kim Seong Min, who broadcasts the daily Free North Korea Radio, and Park Sang Hak, who organizes the balloon launches. Others on the list were defectors involved with getting information in and out of North Korea. What is the most helpful thing President Trump and the United States could do right now? And finally—and most importantly—support the work of the defectors NGOs — they get no support from the ROK or USA governments and yet they are the most effective advocates for bringing about the end of the regime peacefully by bringing about pressure internally. For example, those who served in the military are reaching out to military leaders in North Korea and telling them about what happened in Rumania and Egypt: side with the people against the dictator! 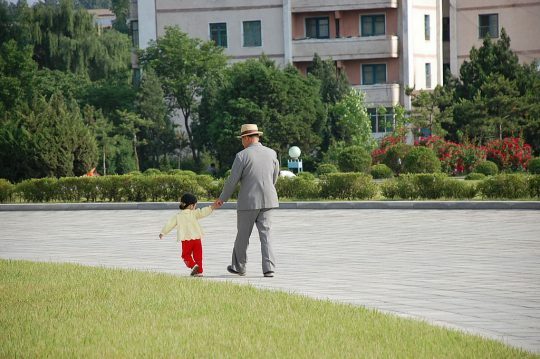 You can read the original interview with Scholte here, a Powerblog preview of the interview here, a collection of anecdotes from survivors of totalitarian regimes, and some information on what Americans can do to help the people of North Korea.